Page Six is reporting that quarterback Colin Kaepernick has just signed a book deal with Random House, reportedly for more than $1 million. 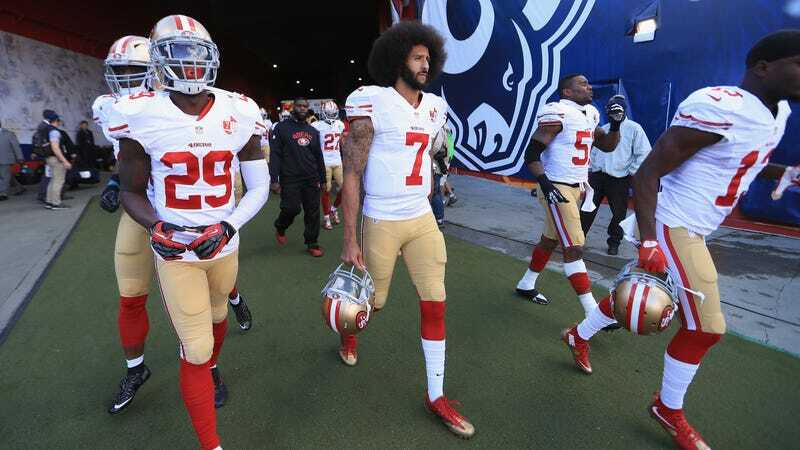 The former 49ers player presumably has plenty of writing time on his hands at present, as he’s not currently signed to an NFL team—a status that we’re sure has absolutely nothing to do with the NFL protest movement he began last year, and which has now spread to numerous players on multiple other teams. This isn’t the only time Kaepernick—who began taking a knee during NFL games last season, in protest against police violence against black people and other minorities—has made headlines in recent weeks. He also recently filed an accusation of collusion against numerous NFL owners, accusing them of freezing him out of the league for political reasons. There’s no word yet on what topic Kaepernick’s book will cover—or how Donald Trump will try to use his Twitter influence to freeze him out of speaking his mind this time—but he reportedly signed with Random House’s One World imprint, which also publishes works from JAY-Z and Ta-Nehisi Coates.